How Global Is K-12 Education in America? Hard-Liners Agree: Good Riddance to Iran Nuclear Deal! Will $500 Billion Make America Feel Secure? If you’re teaching social studies or world history or current events, your students may be curious about the Middle East. The region seems to be unavoidable in global public debate. Here’s a quick quiz to help you teach about the Middle East, whether or not you consider yourself an expert. All shall be revealed with a click on the word “Answer.” Answers are current as of June 2017. A PDF version of the quiz (without answers) is available here. 1. When was the term “Middle East” coined, and in which language? The “Middle East” is not an ancient term, and it is not a term that originated in the Middle East. It was coined in the United States in the late 19th century, popularized in English and other European languages in the early 20th century, and translated into Middle Eastern languages in the mid-20th century. Here is the first reference that I’ve found (so far), from Harper’s Bazaar magazine (March 10, 1883, page 154). As more old publications are digitized, perhaps earlier references will surface. Search for yourself in the New York Times‘s archive, for example (articles before 1922 are in the public domain). Pro tip: put quotation marks around words and phrases (such as “Middle East”) for an exact match; Middle East without quotation may generate results where the words appear separately. Source: Alfred Thayer Mahan, “The Persian Gulf and International Relations,” National Review, September 1902, pages 27-45. Malta and Gibraltar were colonial outposts for British naval forces. 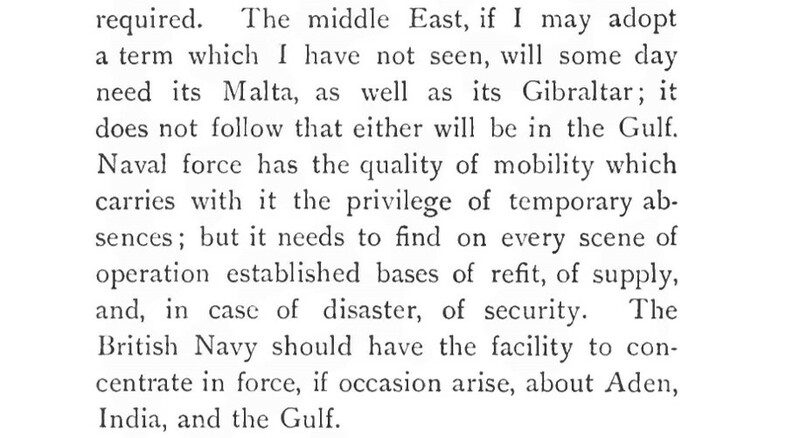 According to Mahan, global naval forces would need similar colonial way stations in the Indian Ocean and the Persian Gulf. The term “Middle East” was rare enough that Mahan thought he had invented it. In the mid-20th century, however, the Middle East migrated westward. The Middle East Studies Association, the preeminent professional association for the study of the region, defines its subject as ranging from Pakistan in the east to Morocco in the west, in keeping with map (d). However, some organizations, especially intergovernmental organizations, use different definitions, such as “Middle East and North Africa” (MENA), in which the Middle East corresponds more to map (c), as distinct from North Africa. Some definitions of the Middle East do not include Pakistan. As an exercise, go to Wikipedia’s page on the Middle East and select various languages from the list on the side of the page – what maps do they use? 3. What are the four most widely spoken indigenous languages in the Middle East? 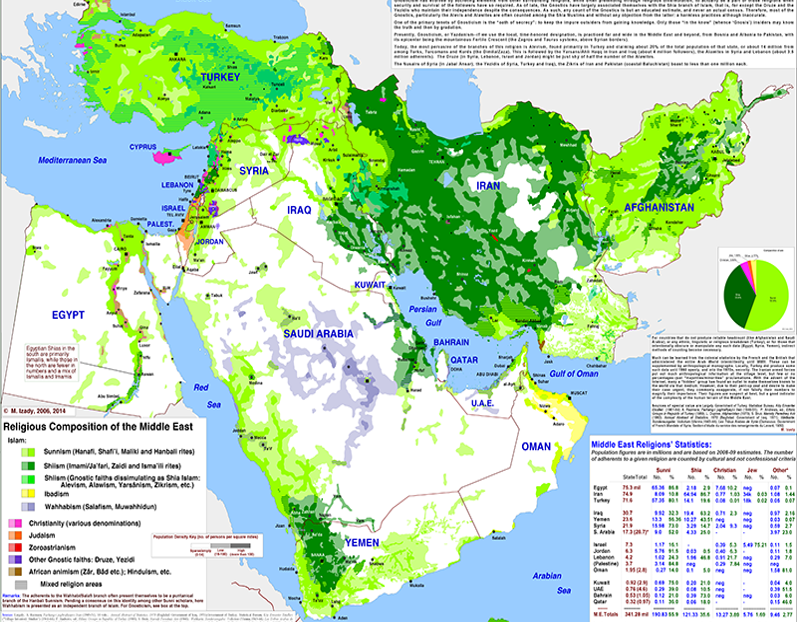 If we use the Middle East Studies Association’s definition of the Middle East, then the four most widely spoken languages in the region are Arabic, Turkish, Urdu (if we include Pakistan in the category of the Middle East), and Persian, according to the Ethnologue atlas of the world’s languages. If we don’t include Pakistan in the Middle East, the fourth most commonly spoken language would be Kurdish, dialects of which are spoken in Iran, Iraq, Syria, and Turkey. Arabic is spoken primarily in North Africa, the Levant, and the Arabian Peninsula. Turkish and other Turkic languages are spoken primarily in Turkey, Azerbaijan, northwest and northeast Iran, and Central Asia. Urdu is spoken primarily in Pakistan, as well as in northern India. Persian (called Farsi in Persian) is spoken primarily in Iran and Afghanistan (where it is known as Dari), as well as Tajikistan (where it is known as Tajik). English is also widely spoken in the region, as well as French (primarily in former French colonies), but the question asked about “indigenous” languages. Other languages in the region include Hebrew and Tamazight (formerly known as Berber), among others. 4. What percentage of the world’s Muslim population lives in the Middle East? 5. 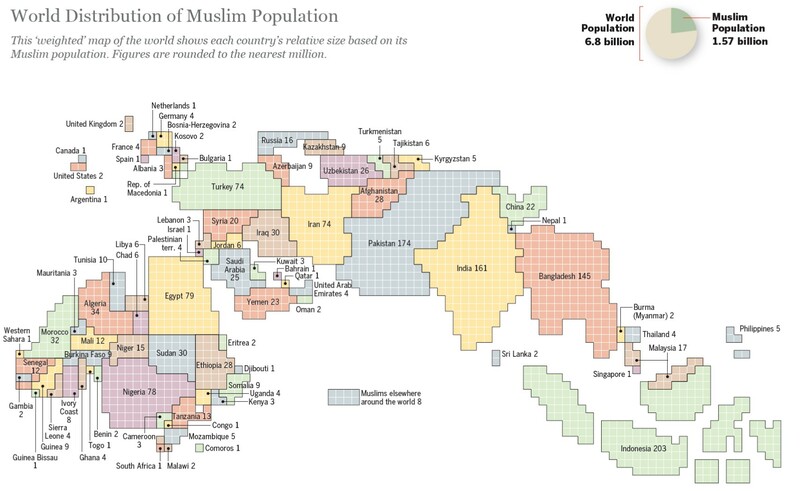 What country has the largest percentage of the world’s Muslim population? (b) Indonesia, with more than 200 million Muslims. a) Approximately half of the world’s Muslims are Sunni and half are Shia. b) Sunni and Shia Muslims follow five different pillars of Islam. c) Sunni and Shia Muslims disagree about the succession of leadership after the Prophet Muhammad. d) Sunni and Shia Muslims have been unable to live in mixed communities due to recurrent conflict. The only correct statement on this list is (c): Shia Muslims, who comprise approximately one tenth of the world’s Muslims – forming a majority only in Iran, Iraq, and Bahrain – believe that the Muhammad, the Messenger of Islam, should have been succeeded by his son-in-law Ali and Ali’s male descendants. Sunnis believed that leadership need not be limited to Muhammad’s lineage. Both Sunni and Shia Muslims follow the same basic creed, although there are slight differences in prayers and various theological issues. On most issues, there is more variety within Sunni Islam and Shia Islam than between them, and Sunnis and Shias have lived together in mixed communities for centuries with rare outbreaks of conflict. The rise of sectarian conflict over the past generation is unprecedented in Islamic history. Note: This map, from the Gulf/2000 collection at Columbia University, treats Wahhabism as separate from Sunni Islam; this view is not widely shared among academics, who generally treat Wahhabism as a subset of the Hanbali school of Sunni Islam. 7. When did Israeli-Palestinian conflict begin? (c) After World War I.
Israeli nationalism, first known as Political Zionism, was invented by Theodor Herzl in 1896; Palestinian nationalism was invented around 1917, as the Ottoman Empire was dismembered in World War I. Periodic conflicts in the 1920s and 1930s predated the founding of Israel in the 1940s and the establishment of a partially autonomous Palestinian National Authority in the 1990s. This is not an ancient conflict. 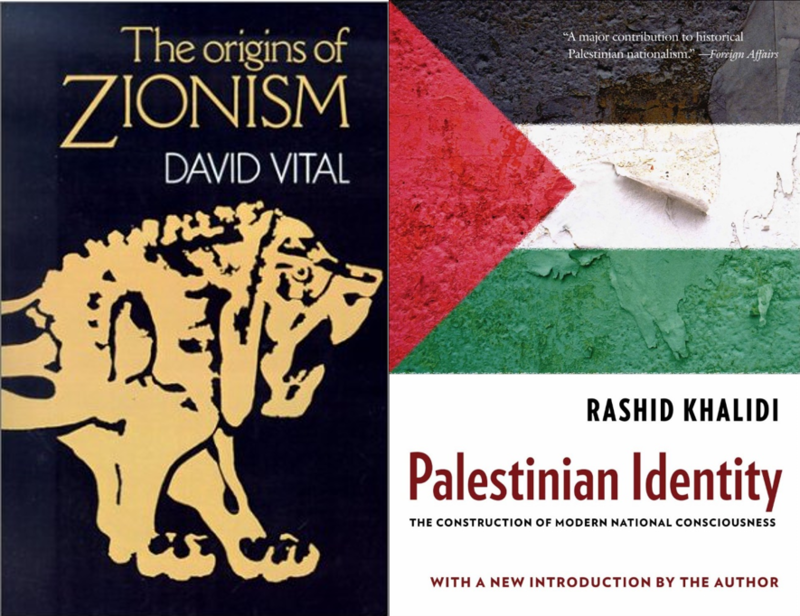 Sources for further reading: David Vital, The Origins of Zionism (1976); Rashid Khalidi, Palestinian Identity: The Construction of Modern National Consciousness (1997). All of them. Americans may not recall all of the countries that the United States has invaded, but many people in those countries remember. 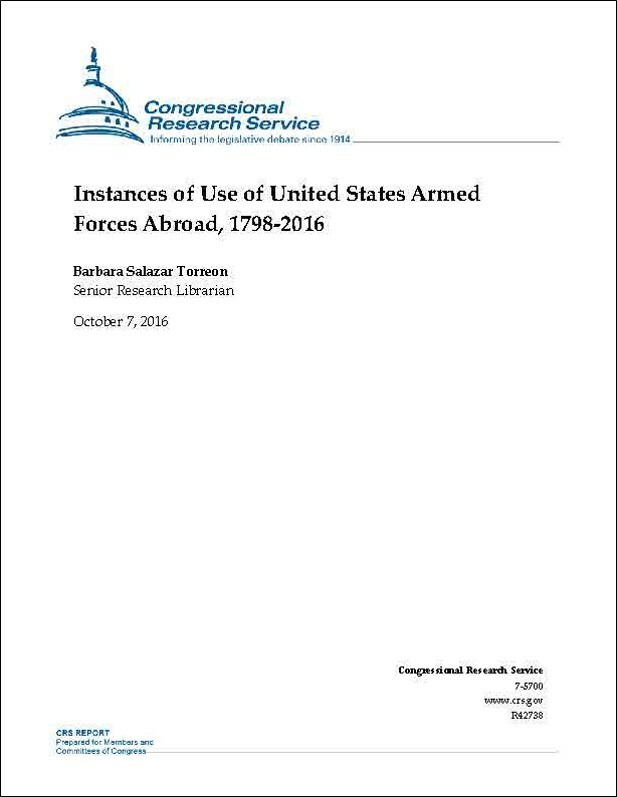 Source: Barbara Salazar Torreon, “Instances of Use of United States Armed Forces Abroad, 1798-2016,” Congressional Research Service, 2016. 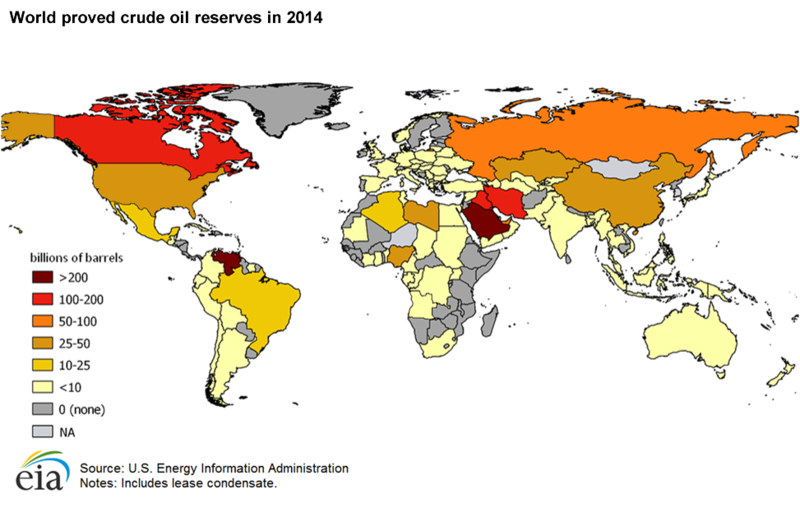 (b) Saudi Arabia and (d) United Arab Emirates have some of the largest oil and gas reserves in the world, but not all Middle Eastern countries are petrochemically fortunate (and not all oil-rich countries are Middle Eastern). (a) 123. A spreadsheet listing these attacks, as well as foiled attacks, is available on my website. 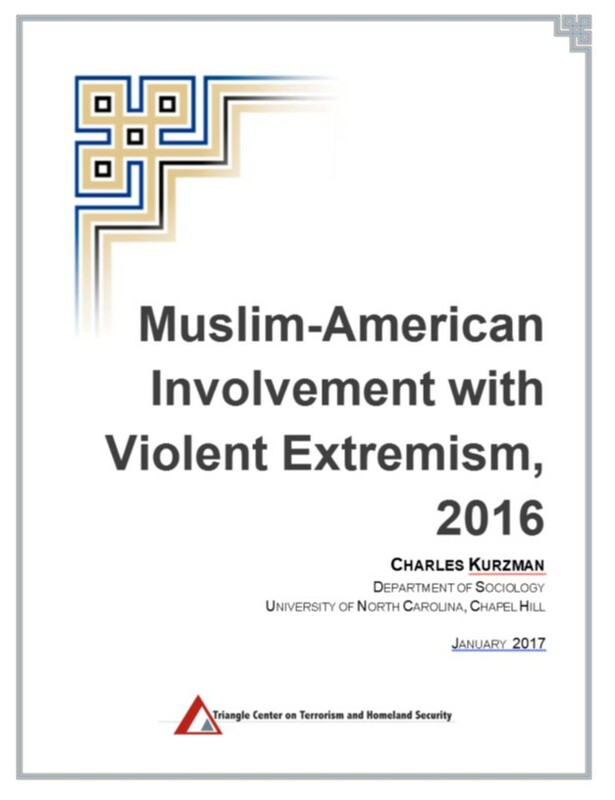 Source: Charles Kurzman, “Muslim-American Involvement with Violent Extremism, 2016,” January 2017. Bonus Question: How many of these were killed by extremists from the seven (later six) countries whose U.S. visas were recently suspended? (a) 0. There have been zero fatalities in the U.S. by extremists from the countries on the Trump administration’s travel ban: Iran, Iraq (later removed), Libya, Somalia, Sudan, Syria, and Yemen. National origin is among the characteristics listed in the spreadsheet on my website. Source: Charles Kurzman, “These Numbers Show Why Trump’s Muslim Entry Limit Is Absurd,” Huffington Post, January 26, 2017. For more ideas on teaching the Middle East, please see this piece from several years ago that uses three contemporary crises as teaching tools. Further information for instructors who are interested in the Middle East is available from the Duke-UNC Consortium for Middle East Studies.